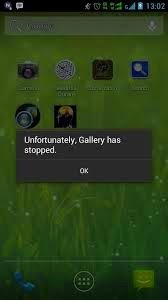 Samsung Galaxy S3 Error: "Unfortunately, Gallery has stopped"
Many got excited when the Android 4.3 Jelly Bean update for the Samsung Galaxy S3 was rolled out later last year. But great expectations are often the cause of a nasty frustration. It didn't take long before owners found out that their beloved phones were flooded with bugs, glitches and problems after the update. One of the most common problems Galaxy S3 owners faced after the 4.3 update is the Gallery app that keeps crashing. Many said the app just closes and brings them back to the Home screen when they're viewing photos, while there were also those who said they were getting the error message "Unfortunately, Gallery has stopped." Pull the Notification Bar down. Tap the Settings icon located in the upper-right corner. Tap More tab, and then Application Manager. Swipe left or right to choose All tab. You are NOT going to lose any of your pictures when you do this, so it's safe. However, it's always recommended to backup your important photos every now and then.